Your laptop hard drive failed? Unfortunately you are not alone. Hard drives have a 100% failure rate. When they fail it takes very specialized tools, knowledge & techniques to recover the data. The good news is that our Laptop Data Recovery services can recover data from most failed lap hard drives. The two main data recovery categories are the same for both laptop hard drives and desktop hard drives. However, laptop drives typically experience more abuse over their desktop counterparts. This type of wear can result in the need for Laptop Data Recovery. It is evident that there are many factors that may contribute to a hard drive failure. We have outlined only the most common occurrences. If your Laptop / Notebook computer is experiencing other symptoms, we are still able to help. 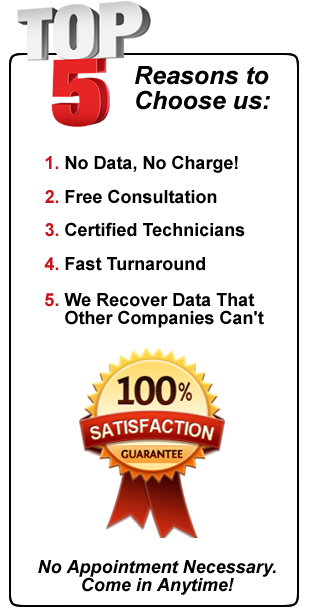 We pride ourselves in our ability to recover data from any type of failure. We are not limited by the complexity, brand, size, or manufacturer of your laptop. If you suspect that you are in need of Laptop / Notebook Data Recovery, taking certain precautions can dramatically increase the chances of a successful recovery. Continuing to power up a failing hard drive can cause irreversible damage and may result in an unrecoverable hard drive. If your device shows symptoms of failure, discontinue use immediately. Level one Laptop / Notebook Data Recovery is when your hard drive is working properly but there is other damage to the computer. This prevents you from accessing your data. For example, you spilled liquid on the computer and it no longer turns on. As long as the drive wasn’t damaged by the liquid, this would qualify as a level one recovery. Level two Laptop / Notebook Data Recovery is where about 80% of our clients fall. In this case, the drive has started to fail but has not yet suffered a catastrophic failure. If the computer powers on but does not boot, hangs, or flashes a folder icon then it may qualify for a level two recovery. However, not all drives with these symptoms will be recoverable using these techniques. About 15% of our customers fall into level three Laptop / Notebook Data Recovery. This is the last resort when dealing with severely damaged drives. It can also be used as a safer alternative to level two methods. At this level, the drive is sent into our clean room laboratory for extensive reconstructive work. The parts inside of a hard drive are incredibly delicate and can be easily destroyed with one wrong move. These recoveries can be considered the equivalent to open heart surgery. They are very complex and require great skill and precision. For more information about Laptop / Notebook Data Recovery & pricing, just give us a call.